Since the early part of the 20th century, scientists have been trying to better understand the intricacies surrounding neuronal development. In particular, the process by which glial cells—specifically, Schwann cells—create their fatty insulating layer that encircles the axons of peripheral neurons. While the interactions between these two cell types hold the key to healthy brain function and cognition, studying the discrete mechanisms of these connections has been notoriously difficult. Yet now, scientists at the University of Buffalo (UB) Hunter James Kelly Research Institute (HJKRI) have developed a new method for what they believe will more precisely capture neuronal interactions. The cellular interactions that trigger the production of myelin are especially hard to pinpoint since the point of contact is essentially buried between the intertwined myelin layers and neuronal plasma membrane. This work may help to provide much-needed insight into demyelinating diseases such Krabbe Leukodystrophy, MS, and Charcot-Marie-Tooth disease. “In Krabbe's, for example, the problem is not just that there isn't sufficient myelin, but that the glial cell is not providing proper support to the neuron. But to figure out exactly what's going wrong, we needed a better way to study that interface,” Dr. Feltri noted. The new technique described in the current study involves using the neuron as a trigger to attract glial cells. The researchers use a cell growth system with two chambers, separated by a membrane. “When the cells in the upper chamber 'recognize' the cells in the bottom chamber, they kind of 'reach' through the holes in the membrane for each other and touch. That is the intersection that we can then isolate and study,” Dr. Feltri explained. 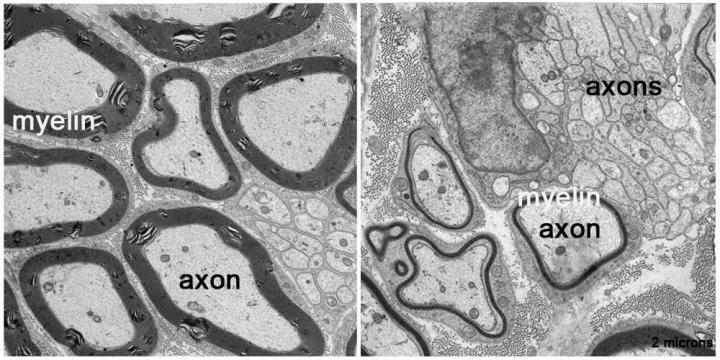 From their study, the researchers discovered a set of novel proteins at that intersection called prohibitins, which, they found, are necessary for the production of myelin. The researchers were excited by their findings and look to continue their work with the hope of better understanding this critical connection between neuronal cells—possibly leading to a druggable target for demyelinating diseases.